A beautiful portrait of family. Not a mystery “Genre” in the narrative structure sense of the word, but rather a mystery as to how writer/director Alfonso Cuaron is able to so deftly communicate narrative structure without being obvious about a single frame. Spider-Man: Into the Spider-Verse literally plasters its central Problem of Expectation on the wall. Roma prefers to embeds its Overall Story Problem of Chaos in silent observations from its passengers. Dog crap in the garage. A forest fire on New Year’s Eve. The bustle of street vendors and a father on hiatus with his mistress. A revolution on the streets of the city. A revolution that ends in a random act of murder. Another lies dead on the street outside of a hospital. Children carried out to sea. Roma bears witness to an imbalance of Chaos from without—from an objective point-of-view of the conflict that affects everyone. But for a story to be complete, it must also extend this exploration of drive into a personal point-of-view. A troubled child. A theater emptying around her. A shattered cup. Random encounters with fate portending an unknowable and unwanted future. 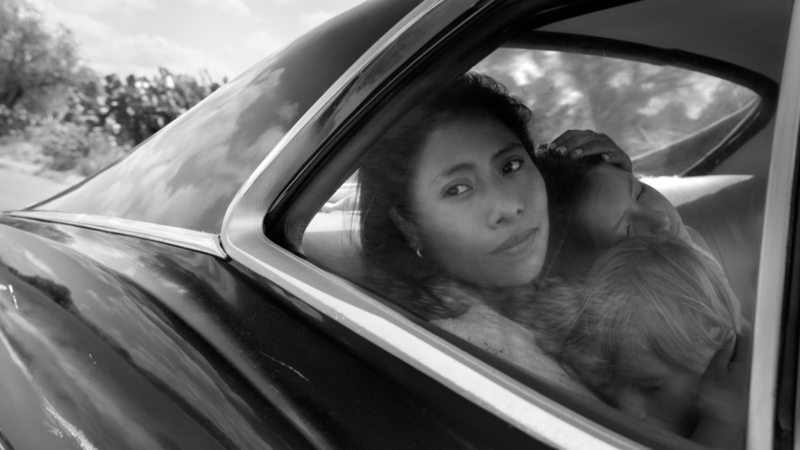 Roma lets us experience an imbalance of Chaos from the perspective of the individual—from Cleo (Yalitza Aparicio). Yet, from this personal—and subjective point-of-view, Chaos appears different. While Cleo objectively contends with Chaos, subjectively she adapts at the drop of a hat. This is strength, and the strength of the message behind Roma. Beset by the troubled child, she lies down next to him, pretending to be dead with him. Asked to clean the driveway once again, she does so without hesitation. Abandoned by her boyfriend, she carries on. In each of these, Cleo drafts reality on her own terms, not in the machinations of others. This juxtaposition between the personal and the extra-personal is carried out without fanfare. Without horns blaring. Unless you count the horns of soldiers marching in the streets—announcing fate without uttering a single word. Roma turns to time as its basis for structure. This kind of foundation is less about ticking time clocks or deadlines, and more about witnessing the passage of time as a flow from one concern to the next. Sensing trouble with one of the children, Cleo takes a break from her chores and lies down next to the child—improving the relationship between them without care for cause or effect. Later, Cleo takes an extended bus ride in search of her boyfriend, Fermin. Her journey through the slums of Mexico seeks no solution, no requirement in support of a particular goal. She aims only to measure the temperature of their relationship. Cleo’s tendency towards holistic problem-solving, a process that measures the balance between relationships first, requires a narrative structure that sees conflict resolution as a journey—not a destination. The effortless camera pans and unobtrusive framing of the cinematography support and reinforces this path of flow. Airliners on their way to their next destination. A gentle and majestic reminder of the comforts of a schedule. The tipping point away from Chaos rests in Order. Resolution—meaningful resolution—sees flow changing direction with a newfound focus on Order, a realignment with planning. A new car. A family adventure. Rearranged bedrooms and clothes that need washing. Acceptance that an unwanted pregnancy was not part of your plan. Order doesn’t resolve as many of Roma’s issues as much as it does point the way. For Cleo. For Sofia. For the family order between them and the children—an order that was always there, and only now just confirmed. A schedule of emotions forever kept. Roma is a beautiful mystery. A mystery as deep and profound as the experience of life itself. Set a time to see it with the ones you love. While uploading the storyform for Roma into Subtext, two Storypoints struck me as compelling examples of pure artistry. The Relationship Story Problem of Self-Aware and the Relationship Story Solution of Aware. Many would interpret this as a problem of personal self-awareness between Cleo and her employer Sofia—as if this was somehow an indication of the “battleground” of their relationship. This Main Character vs. Influence Character notion of the Relationship Story Throughline is always deceiving. Their relationship is the substance of the Relationship Story Throughline. That Self-Awareness problem in the beginning? That’s the idea that I am the employer and you are the employee. While you’re a part of this family, you’re also a servant—don’t forget that. That’s their Relationship being Self-Aware of itself. The “Solution,” or preferably, the direction they move towards to overcome this self-awareness is the narrative Element of Aware. That beautiful image of them all holding each other—that one you see on bus-stops and billboards that you can’t quite make out what it is you’re seeing—that’s a symbol of their greater Awareness of each other. The Relationship becomes Aware of something greater than itself. Again, just more evidence as to the tender and masterful artistry of this narrative.